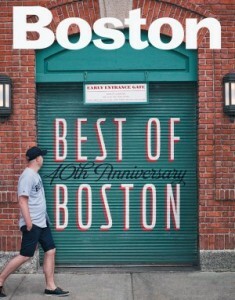 Today we need to congratulate a wonderful client, Shōjō Asian Bar & Bistro, on the amazing feat of winning a Boston Magazine Boston’s Best award within their first year of business. Shōjō won Boston Magazine’s Best Neighborhood Restaurant, Chinatown and was celebrated last night during a great event held at City Hall Plaza. We’re so proud of Shōjō and all the hard work and amazing skill that contributed to this well-deserved recognition. They have been incredibly well received this past year and we are very proud to work with them and get to be a part of it. It’s always great to get to work with clients who are exciting, full of fresh ideas, and motivated to provide the best for their customers, making the job of promoting them so much fun. They are also celebrating their one year anniversary next week so this was a perfect way to round out a wonderful first year. Congratulations again to the best restaurant in Chinatown!